Earlier this week, plenty of people (yours truly included) experienced some...er...frustration when a problem at GoDaddy, the Web's biggest registrar of domain names and host to, like, 5 million Websites, caused many of said sites, or Websites with domains purchased through GoDaddy, to be unreachable. Though there was plenty of speculation at the time that hactivists angered over some of GoDaddy's corporate actions might have been involved, the company claims the problem was internal and nobody's personal or business data was in danger. That said, for those of us who put a certain amount of professional and personal importance on maintaining our Websites, building our readership, and growing our readership community, what are we to do when, through no fault of our own, a Website we are depending on goes down for several hours leaving us with no recourse but to sit and wait for things to be resolved? Well, here at ShawnHessinger.com cool heads prevailed, of course (Ch-yeah, right! 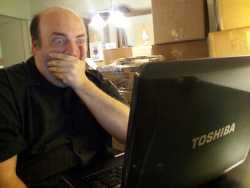 The above photo is an approximation of my reaction as I sat at my Toshiba Satellite that day.) but for those of you lacking our placid stoicism, here are some other suggestions from around the Web. Get mad. This was understandably the first reaction by some when a couple of tweets by anonymous sources seemed to indicate some malicious deliberate action was behind the trouble. I mean, after all, this is our livelihood, in some cases, or a springboard hopefully to career advancement. Mike Daly, editor of Adotas, shot from the hip and asked questions later with an angry post directed at hackers and sharing some angry comments from other online businesses. His anger might have been directed at GoDaddy had he known it was their screw up. Get creative. One company, Coupon Puppet, went to the trouble of creating a puppet show which it then shared on Twitter to get the message out about the plight of online businesses who were being affected by the outage. There was even a musical parody for Coupon Puppet's audience to enjoy while waiting for the main site to again be accessible. Get strategic. Brian Saemann of Go Beyond SEO makes the suggestion that big outages like this are a good time to decide (if we haven't done so already) whether it might be time to make some changes in our hosting. Are we getting the service, quality, security, and customer support we are paying for. However, Peter M. Abraham, of Dynamic Net Inc. points out in this valuable exchange that price should not be your only consideration when locating a hosting company. No matter what your reaction to this week's little emergency, be sure that researching good hosting for your online business is a major priority. Technical problems will always arise, but try to anticipate as many problems as possible when making your choice. This type of hosting is usually used by medium websites with medium storage and bandwidth requirements.